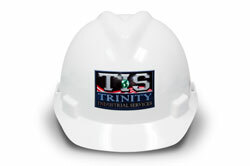 At Trinity Industrial Services, we strongly believe that the safety of our staff, subcontractors, clients and site surroundings is our most important goal. We promote an accident-free workplace and “safety is no accident” philosophy through utilizing our extensive On‐Site Health and Safety Plans and enforcing our comprehensive health and safety policies and practices. We hold all our staff accountable for this program and require participation at all levels. Our health and safety program is designed in accordance with the National Demolition Association and OSHA. Occupational health and safety for all on-site personnel and safety to the environment are always one of the most important aspects of the success of any project. Please read this PDF on Trinity's safety performance.